A one-step, disinfectant cleaner effective against a broad spectrum of pathogens, including MRSA, HIV, Staph and many others. Used for disinfecting ultrasound transducers as well as vinyl exam tables and athletic mats, counter tops, exercise equipment and other hard nonporous, non-surgical surfaces. 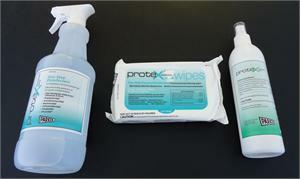 One step disinfection combined with safety for sensitive equipment.